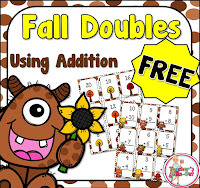 Do your students need extra help with their addition doubles? This FREEBIE provides a set of 18 cards and 2 games to help practice this skill. These games are perfect for the classroom or during small group time. They are also great for game night at home. The two games are Memory and Go Fish. These 2 games are fun and easy to reinforce knowing addition doubles. Just click the picture on the left to download this freebie. Remember it's important to know those doubles. Doubles help students think about other addition facts. Doubles also help with multiplication. If they know their doubles, then they know all their multiplication facts by 2's! To learn more about teaching students to add more proficiently, click here. Don't miss another post from Teacher's Take-Out.